What Else Can I Expect from an Online RN to BSN? Registered nurses (or RNs for short) provide medical care to sick and injured people at hospitals, clinics and other healthcare facilities. While other nursing personnel usually specialize in different aspects of medical care, RNs are trained to handle a wide range of tasks related to patient diagnostics, testing, treatment and counseling. RNs make up one of the largest job sectors in the U.S.; according to the Bureau of Labor Statistics (BLS), roughly 2.75 million RNs are currently employed nationwide and the sector is expected to grow by nearly 500,000 jobs between 2014 and 2024. A bachelor's degree is not required to launch a successful RN career; the BLS notes that many RNs enter the workforce with an associate degree or a nursing diploma. However, a bachelor's can help nursing candidates boost their career standing and compete in the crowded job market. Colleges and universities across the country offer Bachelor of Science in Nursing programs geared toward students who are licensed RNs; these pathways are known as 'RN to BSN' degrees. The RN to BSN curriculum covers different foundational areas of patient care and treatment; students must also complete at least one clinical internship or residency, which allows them to receive supervised, hands-on training from experienced professionals at real-world healthcare facilities. Many of today's students are choosing to earn their RN to BSN online. The curricula of online RSN to BSN programs are often condensed into mini-sessions lasting four to eight weeks; this accelerated schedule enables students to complete their program in as little as one to two years of full-time enrollment. The flexible format of most online nursing degree programs is also ideal for students with part-time jobs, childcare duties and other responsibilities that may interfere with campus-based college attendance. Please note that RN to BSN programs are different from standard BSN degrees. The RN to BSN is designed to be an educational alternative for RNs who wish to earn a four-year degree, while BSNs target students with no nursing experience. For more information on BSN options, please visit our Guide to Online BSN Degree Programs. WILL AN ONLINE RN TO BSN PROGRAM PROVIDE ME WITH THE SKILLS I NEED TO ADVANCE MY CAREER? Most RN to BSN programs are reserved for students who are licensed to work as registered nurses. The curriculum has experienced students in mind; coursework will focus on topics like advanced anatomy and physiology, microbiology, healthcare administration and patient recordkeeping. Students will also get the chance to apply the skills and knowledge they gain during the onsite clinical components of their program. WILL AN ONLINE RN TO BSN WORK WITH MY SCHEDULE? Online RN to BSN degree programs offer a flexible alternative to traditional, classroom-based learning. Students are able to access course readings and lectures, participate in virtual discussions with other students and faculty, submit written assignments, take exams and communicate with their professors from the comfort of their desktop computer. Current technology also allows them to study away from home using a laptop, tablet, smartphone and other portable devices with Wi-Fi capabilities. For added convenience, online RN to BSN students can usually coordinate clinical trainings at healthcare facilities located reasonably close to their current residence. WHAT JOBS CAN I GET WITH MY RN TO BSN? An RN to BSN degree is designed for registered nurses who plan to remain in their current field. Some bachelor's programs allow students to specialize in niche areas of nursing, such as critical care, pediatrics or physical rehabilitation. These concentrations may allow degree-holding graduates to advance to more specialized roles at hospitals, clinics and other healthcare facilities. The RN to BSN pathway also prepares students who plan to continue their education by earning a Master of Science in Nursing (MSN); this degree is required for certain positions in the field, such as advanced practice registered nurses (APRNs) who work as anesthetists, midwives or nurse practitioners. WHAT ARE THE BEST ONLINE RN TO BSN PROGRAMS? Choosing a program is an incredibly personal decision, and only you can properly evaluate whether a target school's strengths match your educational needs. 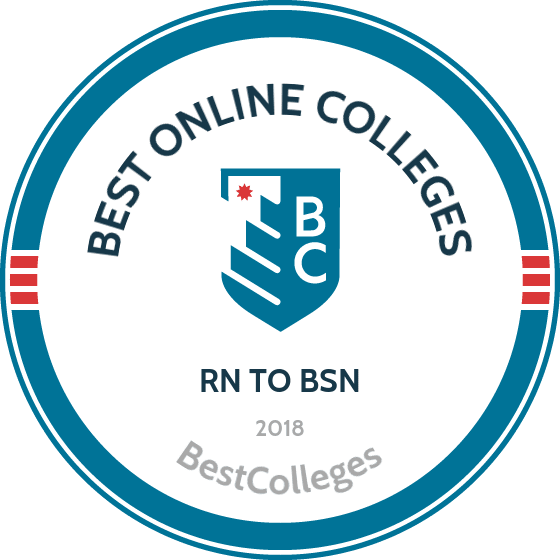 The following ranked list of schools should serve as a helpful starting point in your search for the best online RN to BSN programs in the United States. Our ranking is based on the courses schools offer, available specializations, student outcomes, career support services, and other criteria used to determine academic excellence. If you are considering an online RN to BSN program, be sure to contact admissions specialists at different colleges and universities to learn more their about specific bachelor's degree requirements and offerings. The bachelor of nursing degree at the University of Florida ranks among the nation’s best online RN-to-BSN programs. The degree holds accreditation from the Commission on Collegiate Nursing Education and is approved by the Florida Board of Nursing. The university offers all coursework entirely online in a mostly-asynchronous format, and students never need to visit the school’s main campus in Gainesville. The curriculum is designed for working RNs. The University of Florida’s undergraduate nursing degree serves two main purposes: it prepares RNs for advancement into leadership positions and prepares graduates for master’s programs. Applicants must hold a valid Florida RN license and an associate degree earned with a GPA of 2.8 or higher. Other prerequisites include coursework in psychology or sociology, the physical sciences, anatomy and physiology, microbiology, statistics, human development, and nutrition. The Texas Tech University Health Sciences Center provides health care services to more than two million people in Texas and New Mexico. The school has prepared over 10,000 professionals for careers in healthcare over the past 40 years. Texas Tech’s offers an online RN to BSN program that serves the emphasizes professional nursing practices and holistic health care concepts. The 30-credit program does not incorporate traditional clinical experiences, and students will need to complete field experiences with a mentor. Applicants must have a minimum GPA of 2.5, and additional qualifications like relevant work experience and bilingual fluency will be considered by the admission committee. Texas Tech fosters partnerships with local colleges, such as Alamo and Collin community colleges, to make transition to the RN-BSN program easier for students. All transferred prerequisite courses must have earned at least a "C" grade. Located in Orlando, Florida, the University of Central Florida is a major research institution serving more than 60,000 students each year. UCF has one of the best online RN to BSN programs in the country and is committed to offering innovative online coursework. The curriculum includes classes in nursing leadership, management and role transition or public and community health nursing. All courses are available online, and students also have the option to take certain courses on-campus if they desire a hybrid learning experience. Students are expected to maintain a GPA of at least 2.5 while in the program. Nursing students at UCF are encouraged to join discipline-specific student organizations like the Student Nurses Association. Applicants must have an associate degree, professional experience in nursing, a current R.N. license, and a GPA of at least 2.8 to be considered. The University of South Florida, located in St. Petersburg, serves nearly 40,000 undergraduate students each year. The university offers several distance learning programs in a number of health care fields, including public health and nursing. USF has one of the country’s most innovative RN to BSN online programs, which allows students to create a degree that is customized to help them meet their future career goals. Students can focus on one of three specializations: leadership/management, clinical excellence, or patient/staff education. The program can be completed in five semesters part-time, or in three semesters full-time. This program prepares students for careers as nurses as well as for study in graduate-level nursing programs. While all coursework can be completed entirely online, students must complete service learning requirements at their place of work. Applicants must reside in Florida or Pennsylvania, hold a current state RN license, and have an associate degree in nursing with a GPA of at least 2.5 to be considered. The University of Oklahoma-Health Sciences Center serves about 4,000 students through its Oklahoma City and Tulsa campuses. The school offers over 70 undergraduate and graduate programs, as well as innovative clinical opportunities through its Children’s Hospital and Veterans Affairs Medical Center. Oklahoma's 60-credit nursing program is one of the most thorough online RN to BSN programs, consisting of 30 hours of advanced standing credits and 30 hours completed in the program. The program is designed for RNs and LPNs registered in Oklahoma who are seeking career advancement options. Students can earn their degree in one to two years. The curriculum includes classes in the human experience of disability and contemporary professional nursing. Applicants must have at a cumulative GPA of at least 2.0 and a 2.5 GPA in their final 60 hours to be considered. LPNs will also need to pass entrance exams. Miami’s Florida International University offers an accredited RN-to-BSN online program that helps students build a strong foundation through evidence-based nursing practice. Designed for working RNs, the program is entirely online, allowing ample scheduling flexibility. Students can enroll for any semester on a full-time or part-time basis and complete their studies in three semesters. The university’s curriculum highlights cultural sensitivity, community health, leadership, and wellness. Students must complete 120 credits to earn their diplomas, and most begin FIU’s RN-to-BSN program with 60 credits. Two clinical classes require students to work in an approved facility, but this can be accomplished locally. FIU requires that nurses complete at least the last 30 credits of their degree through the university. The CCNE and Council on Accreditation of Nurse Anesthesia Educational Programs provide accreditation, and the Florida Board of Nursing has approved the curriculum. Applicants must hold a current Florida RN license. The University of Texas Medical Branch (UTMB) has provided exceptional healthcare education in Galveston, Texas since 1891. The university offers a variety of degree programs through the schools of nursing, medicine, graduate biomedical sciences, and health professions. The University of Texas' RN to BSN online is an accelerated program that can be completed in as few as eight months. The program is compatible with the needs of the working registered nurse. The program encourages students to complete a variety of volunteer experiences in addition to clinical requirements which may be completed where the student resides. Applicants must complete a variety of prerequisites before they are eligible for admission. Students must complete all prerequisite courses with a minimum GPA of 2.5.UTMB is known for its committed faculty and student resources. Graduates from the RN to BSN online program are given a special fast track application if they decide to go on to graduate school at UTMB after they have one year of work experience and meet the MSN qualifications. Founded in 1848, the University of Wisconsin-Madison is a top-tier institution for higher education that serves nearly 30,000 undergraduates each year across more than 10 campuses. The university spends about $1 billion on research each year and has graduated numerous famous alumni, including more than 30 Pulitzer Prize winners. Wisconsin’s RN to BSN online program is designed specifically for nurses in the state of Wisconsin, although students from select regions of Minnesota, Iowa, Michigan, and Illinois are also eligible to apply. Distance learners will choose to complete their program in affiliation with one of six home campus locations: Stevens Point, Green Bay, Eau Claire, Oshkosh, Madison, or Milwaukee. The program can be completed in one to three years and is offered almost entirely online, although some home campuses will require limited in-person participation. The curriculum includes courses in chronic care management, cross cultural health, and community health nursing. Allen College, located in Waterloo, Iowa, started as the Allen Memorial Hospital School of Nursing in 1925. Today, the college offers degree programs in a variety of health care disciplines, including radiography, occupational therapy, and nursing. Allen’s 124-credit RN to BSN online program offers exclusively BSN classes, as students must take their general education courses at another accredited institution prior to admissions. The curriculum includes courses in nursing leadership, chronic illness, nursing research, and professional writing. The program is offered entirely online, with the exception of clinical experiences that can be completed in a student's area of residence. The program has one start date per year in the fall, and full- and part-time study options are available. All applicants must have already fulfilled the program’s general education requirements, and transfer students must have a GPA of at least a 2.5 to be considered. East Carolina University is known for offering high-quality health care and STEM degrees, with nearly half of the study body studying these disciplines. The school’s online RN to BSN program prepares students to pursue leadership roles in a variety of health care settings. Students must pass all courses each semester in order to advance in the program. The program can be completed in just four semesters, including summer terms. All courses can be completed online, although some, like professional communication in nursing, require limited in-person practice experiences. The curriculum includes courses in professional communication, nursing leadership and finance, community health nursing, and more. Applicants must have completed all prerequisite courses with a minimum GPA of 2.5, and hold a current nursing license in North Carolina or a North Carolina State Board of Nursing compact state to be considered. Brigham Young University-Idaho is a Church of Latter Day Saints institution located in a scenic region close to both Yellowstone and Grand Teton national parks. The school offers 100 bachelor’s degrees, as well as 11 online bachelor’s degrees and 300 online classes. BYU’s online RN to BSN program has start dates every semester and can be completed in about three to six consecutive semesters. The program's nursing philosophy emphasizes stewardship, knowledge, professionalism, and caring. The curriculum includes courses in health/wellness in aging adults, pathophysiology, and community nursing. Though the program charges the same tuition as on-campus programs, Pathway alumni can benefit from reduced tuition rates, and all distance learners benefit from resources like the Online Support Center and online tutoring. Applicants to online programs at BYU must have at least a 2.5 GPA to be considered. Ohio State University’s nursing college offers an online RN-to-BSN program that holds accreditation from the CCNE. The program is designed for working nurses with an associate degree. Learners can enroll full time or part time and take classes at their convenience; all 120 credits of the curriculum can be earned online. Students can complete the program in a year. The curriculum requires distance learners to complete Ohio State’s general education core and a minimum of 21 credits in the nursing program. Most courses are taught asynchronously. The curriculum emphasizes evidence-based learning, and the program is well suited for nurses who want to move into leadership positions. Students can take classes in any order. The university accepts up to 90 transfer credits, but students must earn a minimum of 30 credits through Ohio State. Applicants must possess an associate degree from an ACEN-accredited university, a minimum cumulative GPA of 2.75, and an unrestricted RN license. Thomas Edison State University, founded in 1972 to serve working adults, offers RN-to-BSN online programs that help nurses progress in their careers. The New Jersey-based institution provides a 120-credit degree that teaches registered nurses the knowledge needed for career development or to earn a master’s degree. Undergraduates can accumulate up to nine graduate-level credits. Students interested in obtaining a master’s degree can also enroll in an RN-to-BSN/MSN program. TESU’s program allows distance learners to complete the program at their own pace. Students can complete the program in a year or over the course of several years. Coursework is taught asynchronously in 12-week terms. Students must complete the university’s general education curriculum and lower and upper-division classes in professional nursing. Electives fill out the remaining credit requirements. TESU offers open and rolling admissions, letting degree candidates enroll at their convenience. The university also offers provisional acceptance to students awaiting their RN license. As many as 90 credits can be transferred in from an associate program. Mississippi College, the oldest institution of higher learning in the state, offers an accredited online RN-to-BSN program that embraces the school’s Christian values. In this 30-credit program, nurses learn Christian caring along with critical thinking skills and evidence-based practice. The college developed its CCNE-accredited curriculum for working professionals, allowing students to earn their degree in a year or less. All required classes can be taken online. Nurses can enroll full time or part time, taking one, two, or three classes during accelerated, seven-week terms. The college formats most coursework asynchronously, and students enjoy close relationships with their instructors and classmates. The program gives participants a broad education in areas that include leadership, research, community health care, and informatics. Applicants must hold an associate degree with a minimum 2.0 GPA, an unrestricted RN license, and submit to a criminal background check. Founded in East Lansing in 1855, Michigan State University was the nation’s first land grant institution. Today, the university serves more than 50,000 students each year and offers over 200 programs in its colleges of education, arts and letters, and nursing. MSU’s nursing degree is among the most hands-on RN to BSN online programs in the country. The curriculum requires students to complete 117 clinical hours through the leadership immersion and community and population health nursing classes. Clinical requirements can be completed at the student’s place of employment, but not in the unit in which they normally practice. The program was designed as a part-time degree for working nurses, and can be completed in just 18 months. Students can transfer as many as 60 credits from a community college, and will be granted 30 credits for passing the NCLEX-RN test. Applicants must have a GPA of at least 2.75 from their associate degree program to be considered. Central Methodist University, a private, liberal arts school in Fayette, Missouri, offers an online RN-to-BSN program that combines asynchronous, computer-based learning with hands-on clinical practice. The 124-credit program emphasizes leadership, communication skills, patient assessment, and care implementation. The curriculum features coursework that covers allied health, end-of-life care, hospices, rural health, and professional nursing practice. Students must also meet the university’s general education requirements. Most classes are taught asynchronously. Degree candidates can transfer up to 40 nursing credits, as well as applicable general education credits from an accredited university. Applicants must possess a current RN license and an associate degree earned with a minimum 2.0 GPA. The school recommends that applicants have at least one year of work experience, although this requirement may be waived. Founded in Tuscaloosa in the 1831, the University of Alabama was Alabama’s first public college. The school offers a number of undergraduate degrees for distance learners in the arts and sciences, business, nursing, and more. Alabama’s RN to BSN online programs allow students to either pursue an RN-BSN degree or an RN-BSN/MSN degree. The RN-BSN/MSN degree is an accelerated full-time program and allows students to focus on either clinical nurse leadership or case management leadership. The RN-BSN degree can be completed in 25 credit hours, either part- or full-time, and includes classes like complex client systems for registered nurses. Applicants must have a 2.5 GPA in lower-division courses and at least a 2.0 GPA in science courses to be considered. All distance learners will pay the same tuition rates, regardless of residency. Clemson University, located in Clemson, South Carolina, offers more than 80 majors and 70 minors to 16,000 undergraduates each year. Clemson has one of the best RN to BSN online programs, with a strong emphasis on community service and hands-on learning experiences. Coursework can be completed entirely online, but students must regularly participate in monthly learning activities with both their professors and classmates. Students also gain practical experience with community partners at one of Clemson’s four clinical hospital sites. Clemson boasts that graduates from its nursing school have an almost 100% job placement rate within three months of graduation. While there is not a specified transfer credit limit, all transfer credits must be a "C" grade or better and must be approved by the Office of Admissions. Applicants must already be registered nurses and provide current SAT or ACT scores to be considered. Recognized as one of the best public universities in the South, UNC-Wilmington hosts an array of online degrees, including an accelerated RN-to-BSN program. The 29-credit curriculum is ideal for working nurses, who can complete the program in one year. The degree includes a 31-hour residency requirement. Accredited by the CCNE and approved by the North Carolina Board of Nursing, this program features practicums that students can complete at their own workplaces. The school offers classes in accelerated, seven-week sessions, and all coursework is available online in an asynchronous format. Six start dates throughout the year give nurses the opportunity to begin their studies at their convenience. UNC-Wilmington recommends that students set aside 12-15 hours a week per course. Students must complete a capstone project. The university allows degree candidates to test out of some courses through its College Level Examination Program. Students must transfer in at least 24 credits, including six in English and three in college-level math. Learners must also possess an unrestricted RN license. Based in Omaha, Nebraska, Clarkson College was the first school of nursing in the state. Clarkson is a leader in online education, and the school estimates that about 90% of its students take at least one distance learning course. The school offers a wide range of health care programs in education and leadership, nursing, and more. Clarkson's 130-credit RN to BSN online program offers an accelerated option and small class sizes. Students are automatically granted 43 transfer credits on admission, allowing most students to earn their degree in about three to six semesters. Unlike other RN to BSN programs, Clarkson doesn’t require clinical hours. Instead, all students are expected to complete service classes and civic service activities. Graduates leave the program prepared to pursue careers as clinical nurses, lead nurses, or to work in government agencies, nursing homes, and other non-hospital settings. Applicants must provide a copy of a current nursing license to be considered. UNC-Greensboro’s online RN-to-BSN program is taught through a hybrid format and allows working RNs to earn the degree with part-time study. The curriculum is taught through a cohort format, which learners can complete in three semesters or less. Students can complete many of the required credits online, but they must travel to Greensboro once a week for classes. The curriculum opens with a writing-intensive session and a physical-assessment course that features a real-time lab. Nurses can complete the clinical components of their other classes independently through a project-based format. UNC-Greensboro’s nursing school holds accreditation from the CCNE. Applicants to this program must hold an unrestricted RN license. Other prerequisites include a class in statistics and a historical perspective course. Up to six nursing credits can be transferred in from another RN-to-BSN program. Opened in 2013, the University of Texas Rio Grande Valley offers a fast track RN-to-BSN online program that gives RNs the opportunity to advance in their careers while working. The program, which is built around classes related to professional mobility, pharmacology, patient assessment, and community health, features a 27-credit curriculum. Coursework is scheduled in accelerated, seven-week sessions. Professors deliver most coursework asynchronously, and nurses can earn their diplomas in a year. UTRGV’s online RN-to-BSN program began in 2017. Participants learn theory, practical applications, and leadership skills, and the curriculum emphasizes evidence-based care. The program requires no visits to the school’s main campus in Edinburg. Admission requirements include an RN license and an associate degree earned with a minimum GPA of 2.5. The Southern Association of Colleges and Schools Commission on Colleges accredits programming at UTRGV. Oklahoma State University hosts dozens of degree-granting programs through its virtual campus. The university offers a comprehensive bachelor’s in nursing that ranks among the nation’s best RN-to-BSN programs. The university created its curriculum using standards set by the American Association of Colleges of Nursing. Students learn about evidence-based applications, information technology, and bedside manner. The program stresses leadership, communication, and the importance of a liberal arts foundation. Most nurses enroll in this program after already earning half of the 120 credits needed for a bachelor’s degree through an associate program. Oklahoma State’s curriculum requires the completion of eight RN-to-BSN courses, 41 general education credits, and six credits in health education and promotion. The university offers all coursework online in accelerated, eight-week sessions. Most classes use an asynchronous format. Applicants must hold an unrestricted RN license, an associate degree or diploma in nursing from an accredited school, and a minimum collegiate GPA of 2.5. A national leader in internet learning, Nova Southeastern University offers an online RN-to-BSN program that allows working nurses to earn their bachelor’s degree in four semesters. The curriculum at the school’s nursing college builds on the nursing precepts taught at the associate level, adding classwork in management, policy, community service, and business. Most of this CCNE-accredited program takes place online, but students must travel to hospitals and clinics to engage in some on-site practice. The curriculum includes 36 credits of RN-to-BSN classes. Students must also complete 30 general education credits, if they didn’t already do so while earning their associate degree. Faculty typically teach distance courses in an asynchronous format. This Fort Lauderdale-based university requires that applicants submit their transcripts and proof of RN license through the NursingCAS verification agency. Appalachian State University serves almost 20,000 students through over 150 undergraduate and graduate degrees, and the school estimates that more than 1,000 students are distance learners. Although the school's Nursing Department wasn’t established until the mid 2000s, it already has one of the country’s top online RN to BSN programs. The department emphasizes that all good nurses should have technical savvy, sound decision-making skills, and the ability to clearly communicate. Appalachian State’s nursing courses are offered completely online, both synchronously and asynchronously. The 30-credit program can be completed in only one year and has three start dates each year. Applicants must have completed all required lower division coursework while maintaining a minimum GPA of 2.5 before being admitted. They must also hold a current nursing license in North Carolina or a North Carolina State Board of Nursing compact state to be considered. RNs must be licensed in all 50 states and the District of Columbia. Licensing requirements vary by state. The need for RNs has risen significantly in recent years. Millions of previously uninsured Americans now receive medical insurance coverage thanks to the Affordable Care Act (ACA), and an aging baby boomer population has also fueled the demand for qualified nursing personnel. The Bureau of Labor Statistics (BLS) estimates that 2.75 million RNs are currently employed in the U.S., and projects that the number of RN jobs will rise 16% between 2014 and 2024; this growth will result in roughly 439,300 new jobs. The table below looks at the unemployment rates of RNs and four other healthcare-related occupations. All five entries were featured in the 'Best Healthcare Jobs' of 2017 ranking published by U.S. News & World Report. Students who earn an RN to BSN will enjoy higher earning potential than their counterparts who complete their education with an associate degree or a nursing diploma. Using data from PayScale, the table below examines salary expectations for bachelor's-, associate- and diploma-holding nurses at four career benchmarks. According to the data listed above, BSN-holders experience 40.3% salary growth after more than 20 years in the workforce. By comparison, those with a nursing diploma report 81.5% growth while associate in nursing recipients report 21.4% growth. However, specific job title and professional experience will also impact earning potential for BSN students. The next table looks at the 20-year salary growth projections for RNs and four other popular nursing career pathways. Of all five occupations listed on the table, RNs reported the lowest salaries at all four benchmarks. However, RNs also experience the highest rate of salary growth: a 26.7% increase between the entry-level and late-career stages. Nursing directors ranked second with 16.2% earnings growth after 20 years on the job, followed by clinical nurse managers with 15.5% growth. Students who graduate from an RN to BSN program will be qualified for hundreds of nursing positions, although it's important to note that re-licensure is required whenever the license-holder moves to a different state. Let's look at the two most common career tracks for people who complete an RN to BSN online program. Addiction Nurses: These RNs care for patients undergoing treatment for alcoholism, drug dependency and other forms of addiction and substance abuse. Cardiovascular Nurses: These RNs specialize in patients with heart diseases and conditions, including those who are undergoing or in recovery for surgical procedures. Critical Care Nurses: These RNs provide round-the-clock care for patients who are severely injured or seriously ill.
Genetics Nurses: These RNs specialize in patients with genetically-inherited conditions, such as hemophilia, cystic fibrosis, Parkinson's disease and Alzheimer's disease. Neonatal Nurses: These RNs monitor and evaluate newborn babies, and also care for mothers who have recently given birth. Nephrology Nurses: These RNs specialize in patients with kidney diseases, conditions and injuries. Rehabilitation Nurses: These RNs offer care and assistance for patients with permanent disabilities that require constant monitoring and evaluation. RNs must receive full licensure in all 50 states and the District of Columbia. A universal requirement for RN licensure is a passing score on the National Council Licensure Examination (NCLEX-RN). Other licensing requirements vary by state, but often include a set number of post-college training hours, as well as continuing education coursework on an annual basis after licensure is awarded. Nurse Anesthetists: These APRNs (also known as CRNAs) deliver anesthesia to patients who are about to undergo a surgical procedure or operation. They also provide pre- and post-operative care and support to these patients. Nurse Midwives: These APRNs (also known as CNMs) support women who are pregnant or in childbirth. They may also perform gynecological exams and provide post-natal (post-birth) care. Nurse Practitioners: These APRNs (also known as NPs) care for patients with critical or acute conditions that require constant monitoring, evaluation and support. They often provide counseling to patients and their families, as well.